Now, up until the last year or so I have not really had the joy of experiencing some nicer yarns. 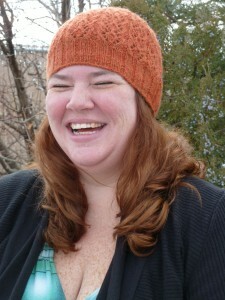 I have knit mainly with cotton, Lion Brand Wool-Ease, and various acrylics and not so great wools. But then it came to my attention that I live near Jimmy Beans Wool. Oh, woe is me. This is a double-edged sword. I go there and tell myself I will just pet the yarn, but invariably I end up walking out with something(s). 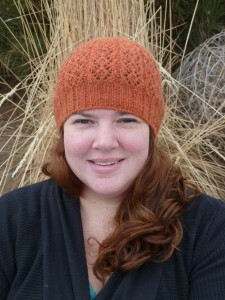 Listening to all of the podcasts I do, I have heard many brand name yarns that are quite popular. So on my first visit to JBW, I think I did a lot of internal squeeing, and possibly some squee that made it out of my mouth. Malabrigo, Cascasde, Debbie Bliss, Handmaiden…I could go on and on. And don’t even get me started on the SOCK YARN. I was in major sensory overload and my fingers were itching to throw all the yarn in a pile in the middle of the floor and just roll around in it, curl up, and fall asleep in the soft, fluffiness that are these yarns. Good thing for the staff of JBW I have a little self-control. Good for me too, I guess, since I would have become acquainted with the local PD. So…I was glad that I had only spent 25 cents on each of the 6 skeins of Classic Elite BamBoo that I purchased. There were 3 colors: Light, periwinkle blue, black, and white. I made a beret out of some of it, but still have quite a bit left. That yarn is so damn splitty it’s not even funny. Now, I don’t know a lot about how a twist in yarn works, or if it’s even possible with bamboo yarn, but some twist would have really helped. I felt like I was knitting with 10 strands of sewing thread held together. The blunt bamboo needle I used for it helped, but looking at that beret I am not at all happy. There are little strands that didn’t get picked up with the needle, and I was very disappointed. I love the drape, it is heavenly soft, but damn…splitty=sucky knitting experience. 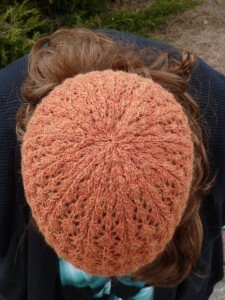 On the other hand, I got some Ultra Alpaca in a beautiful rusty orange that I got from a destashing raveler. The minute I received it I tried to figure out what I was going to make with it, and cast on. This yarn is heaven. 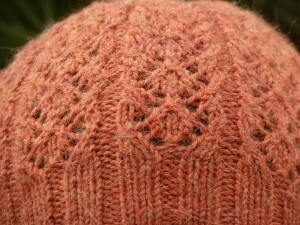 It is so soft, knits up beautifully, has such great stitch definition. I whipped that hat out in no time, and wear it all the time. I have since bought some Ultra Alpaca Light in a gorgeous light aqua color as a gift to myself for losing weight – it will be the prettiest, softest sweater that I have ever known. Just a little more to go and I will be casting on for that. The interesting thing is that people still think that they have to go to a big box store to get yarn because they are on a budget. Heck, I am a single mom, and on a massive budget. But I have gotten Wildfoote sock yarn at a thrift store for $3.00 for 2 skeins. 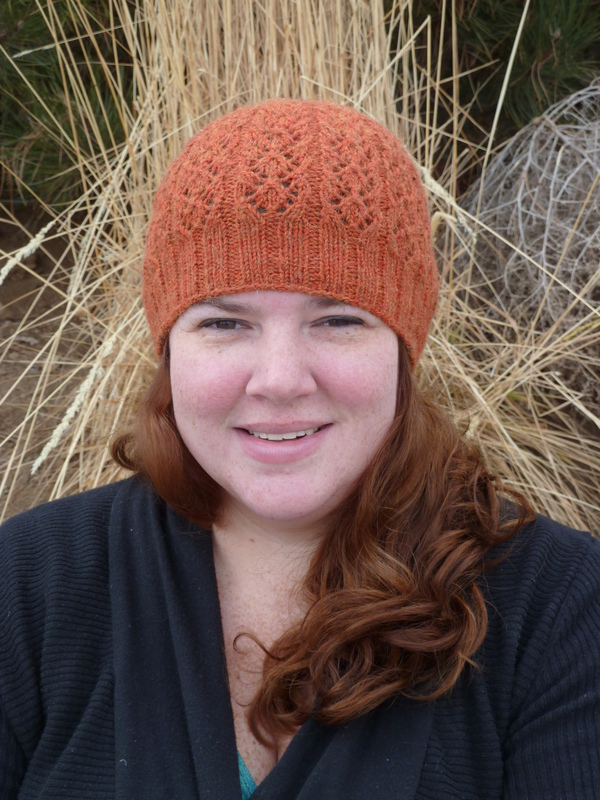 Knit Picks, Webs, destashing ravelers, and even your LYS or online yarn stores. 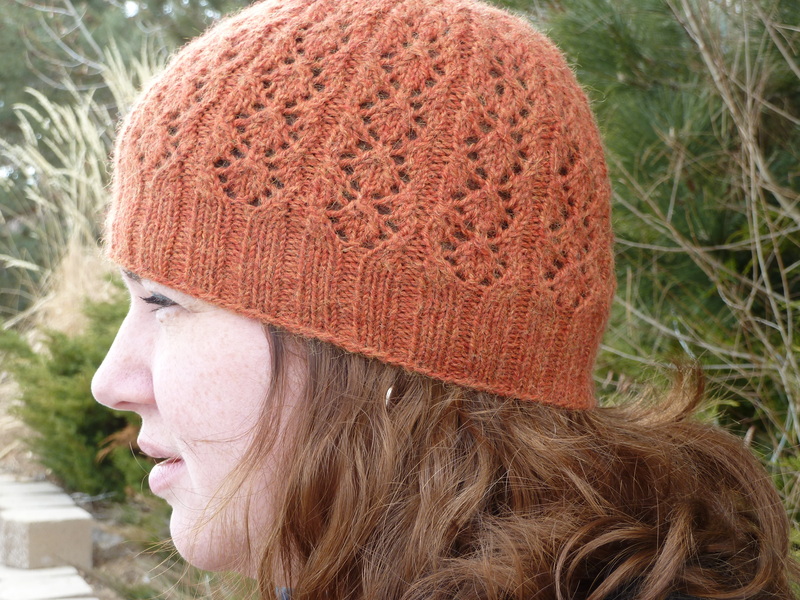 There are constant sales, constant discounts that you CAN try the nicer yarns without breaking the bank. Now, granted, I have yet to even pet cashmere because I know I will want it and I can’t get it, but I have bought Malabrigo sock yarn on sale, Regia Silk sock yarn on sale…if you take the time to look, you do not have to sacrifice your pocketbook for a quality yarn. I know that I feel tons better giving a gift made out of a nicely made, soft, lovely yarn than I would Red Heart. And it is so much more enjoyable a process knitting it too, when you are knitting with a soft fiber that gives you joy just looking at it. There is a time and place for Acrylics, and they have changed much over the years, but for me, personally, I won’t touch Red Heart again after the exposure I have received the last year to nicer fibers. My son loves being the recipient of knitting items. I never, ever thought that he would dig them so much. I started knitting him Askel, and I have since come to the realization that said sweet little man has a massive sensitivity to wool. Askel was about 75% in a beautiful blue merino. Yeah. I still haven’t the heart to rip it out. I have some cotton fleece I think he will be ok with…I think I’m going to make him a hat or scarf or something and see how he does with it. 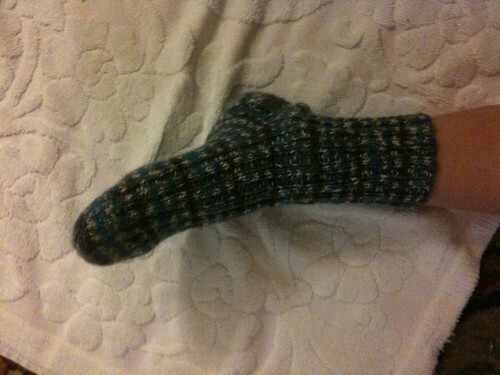 So I knit him a pair of socks. This is my 2nd full pair of socks and they went so much quicker than the first pair (4 days as opposed to 6 months)…and when I finished the first one a couple days ago, he took both of his regular socks off, and wore the single sock all the rest of the night. He wanted to wear it to bed, too, bless his cute little heart. So I finished them tonight, and he wore those around all night. I told him he had to take them off if he wanted to wear them to school. I can see that I am going to have to be making that kid some more socks, those are not going to last too long if he wears them as much as he wants to. Which I will gladly do with no complaint…that smile is more than worth the hole I seem to put in my pointer finger every time I knit with tiny needles.